The previous post out of the archives was intended to cue up your thinking for today’s discussion: taking things one step further and exploring the relationship between design, photography and composition. Some of you probably know that beyond photography, I’m involved in design work on two fronts – as lead designer at Horologer MING, my watch brand, and as a consultant at Hasselblad. There is a popular misconception that design is mainly about a few things: style, function/ usability/ UI/ ergonomics, and differentiation. In reality, design is really about making a set of coherent choices in an environment where there are choices to be made I’d argue that beyond and above this, there’s really only one overarching principle that should be the basis of all good design: I think of it as one of composition. Just as the way we ‘read’ an image is determined by somewhat immutable physiological underpinnings (rules of vision, part I and part II) that are common across all human observers with normal vision – the important thing here is these same rules apply to anything we look at. A photograph, painting or other graphic presentation is merely a two dimensional representation of reality; to our visual cortex all stimuli must pass through the same neural pathways and the same ‘processing algorithms’ before being interpreted. Put simply: there is a reason warning signs are bright red and highly contrasting. We notice brightness/ luminance contrast and color/color contrast in that order; anything that breaks pattern signals to us to take notice (undoubtedly as a holdover from the days when it made the difference between being eaten and doing the eating). Yet you’d be surprised just how many designs completely ignore this at the priority of other things that don’t matter – affecting both functionality and overall coherence. In something like a watch, this is especially important: there are so many designs that are arresting as a whole, but are completely impossible to read. (No doubt their owners resort to their mobile phones to read the time.) We simply didn’t see this kind of thing when a watch was a tool, with a single purpose: to tell the time. The morphing of a watch into a social beacon has shifted priorities from one function (timekeeping) to another (attracting envy). To that end – such designs are inherently successful if they are noticed regardless of functionality or longevity, because anything else they might do is simply a bonus. It’s not difficult to make a set of compositional choices that might be different, but jarringly so – that still represents breaking pattern and thus noticeability – but something else entirely to do it in a way that’s still attractive, harmonious and has some hope of longevity. More so in a class of product that has fairly well established norms and conventions; there is a reason why we do not see watches with 10 hour and 3 minute divisions. There is no reason it couldn’t be done, but what would be the point? Our 17.03 (shown in 2D render and actual photograph) was designed according to these principles. I cannot help but look at the whole watch as a composition when I design: the dial is the subject, with the main timekeeping hands taking priority; thus they must be the boldest and most easily recognised element on the face. Next comes the indices that enable you to read the time – these should be regular and easy to take in at a glance in order that the relative position of the hands can be discerned; we cannot easily count more than three or four divisions at a glance, so having a distinctive quadrant divider (numerals in this case) serves the function of keeping the indices bold but easily differentiable. Coming next is the second timezone marker and its set of indices; this must also be easily legible (i.e. high contrast) but not more prominent than the main timekeeping hands and indices – therefore necessitating them to be smaller). Thus the first thing you notice is the position of the hands, for approximate time telling at a glance; then the indices, for more precise reading, and finally, the alternative timezone. The rest of the dial background serves as visual texture for the presentation, in a similar way to how the background elements sets the context for the subject in a photograph. The watch case is a reinforcing frame and should serve to support the overall personality of the piece, and have some distinguishing details, but ideally not dominate – in the same way as one chooses the frame for a photograph carefully to isolate, but not overpower. Notice I do not have a second hand, sub second divisions or even individual minute markings – this is a consequence of a second important principle of design. Most people understand it as minimalism, but that’s a bit misleading because it tends to be taken to extremes. I prefer to think of it as prioritisation or reductionism: getting rid of the bits you don’t need, so that the important stuff has higher visual priority. In the case of the watch, if such accurate time telling is necessary, then you probably want to have something with an instantaneous and discreet unit digital display; analog displays are slightly imprecise by nature. A five minute division is good enough to approximate to the nearest minute; the second hand is not so useful unless you need a running indication (and again, you can simply listen to it tick if necessary). The compositional analog is of course conscious exclusion: frame such that anything that might possibly be distracting or confusing to the narrative is simply not in the frame. Given how much of the interpretation of a photograph is both influenced by social context and personal biases, it’s important to remove any possibly ambiguity such that the photographer’s intended message doesn’t get lost in translation. 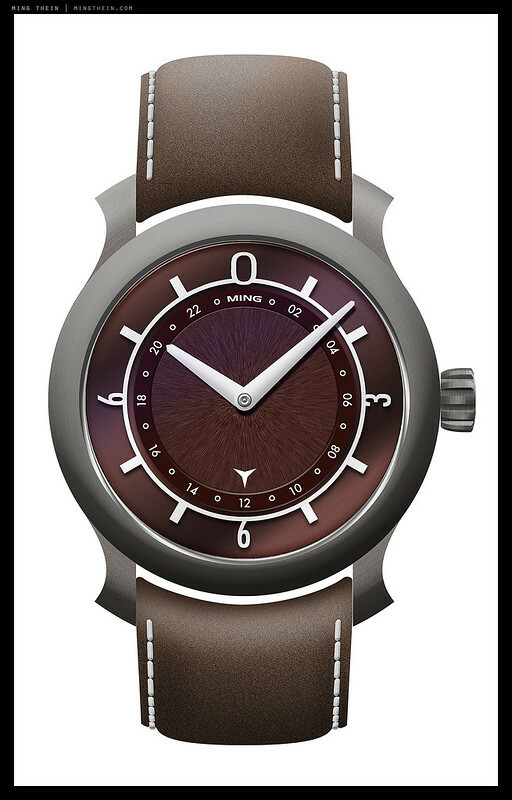 At the same time, there are non-primary cues that can be used to change the mood (for a photograph) or feel (for a watch, or other object) – shifting from a black to dark maroon dial, for instance, makes it a less serious piece; a different strap could go from dressy to casual – much like a 500K white balance shift in either direction can make the difference between welcoming and warm or cool and standoffish. As much as I like the clean design, I’m personally feeling a dissonance interpreting the outer 12-hour and 24-hour inner rims at two points. Looking at the 3 in the outer rim (which I can see as a 3 any way I look at it), I first and mostly see a 90 in the inner rim. At the other side it is even more confusing, is that a 6 with 18 or a 9 with 81? Maybe it’s just the way my brain works, but I would definitely flip the 06 and 18 in the inner rim so that they can be read correctly looking from the outside in. Beautiful watch. 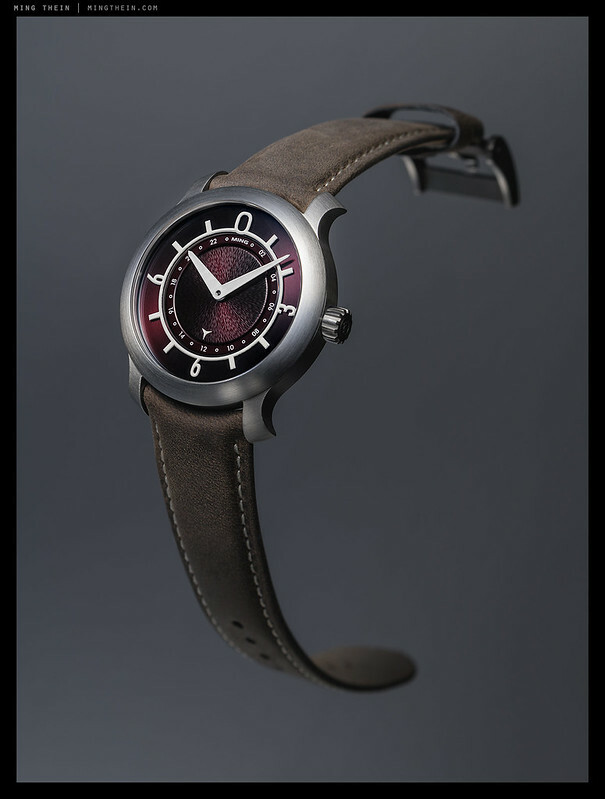 There is something very visually appealing to the four metal flare outs that seem to provide a bit of counterpoint to the smooth round modernism of the watch. Maybe they do catch on sleeves (I don’t own the watch) but I like how they look. I like your comparison of design to composition. I feel conflicted over the nice small size stainless Apple smartwatch I’ve been using recently to get activity and sleep monitoring. It has a beautiful band and clean minimalist design but lacks the always on glance at time convenience of my Rolex Submariner and of course the masculine heft and good old mechanical vibe which does not require constant recharging. Both good designs in their own way but emotionally much different. Thanks, and no they don’t catch on sleeves – at least not for us, but I suppose if you wear it very loose it’s possible. The Apple watches are interesting because of the level of manufacturing precision they offer at such a low price point; but of course if you make tens of millions of something, you can afford to economically make them almost no matter what. Most of the industry doesn’t see smartwatches as a bad thing because serious collectors won’t switch, but non-watch lovers might – in our favor. I rather like the curvature and swell of the strap at its anchor end. 19.01. backside looks very Wimmelbild to me, and it makes full sense given the (lack of) function. Agreed – and I think it’s also this apparent contrast between complexity (back) and apparent simplicity (front) that makes things interesting…or maybe it’s order vs control vs chaos…lots of visual and conceptual contrasts and tensions going on here. I’m with you 110%, Ming – my artistic & creative philosophy is “less is more!” With a watch, I don’t need numerals – 12 markers, 4 of them slightly larger, and fine marks for the minutes. I can agree with GDM – a sweep second hand has been pretty standard for a very long time. But after that, if I want something that light a path, I’ll get a torch – something to take photos, I want a camera – something to make phone calls and maybe tap into the net, I’ll have a cellphone. I couldn’t bring myself to waste money on a cross between a Swiss army knife and a clock, to strap around my wrist! On the subject of design… I recently bought a 17.3. A very nice time piece and I’m enjoying playing with the separate time zone feature (very well implemented; much better than a formerly owned Cartier that had a similar feature). I do miss the sweep second hand but not a deal breaker. The second hand is a visual cue from which you can tell at a glance that the watch is working (not as easily done with only minute and hour hands). But one design element I would change… the metal flare outs to the left and right of the spot where the strap/bracelet attaches could be a little less sharp. These can and do catch on long sleeve clothing and jackets. My 2¢.